Cities are all but shutting down across the US Midwest as the region shivers through a record-breaking and deadly cold snap known as a “polar vortex”. At least six people are reported to have been killed across several states as a result of the arctic weather. Temperatures have dropped as low as -45C (-49F) in Chicago and -54C in North Dakota. Freezing weather will chill 250 million Americans, and 90 million will experience sub-zero temperatures. Twenty million people in the continental US will experience temperatures of -28C or lower by the week’s end. States of emergency have been declared in the Midwestern states of Wisconsin, Michigan and Illinois, and even in the Deep South states of Alabama and Mississippi. “This could possibly be history-making,” said Ricky Castro, a National Weather Service meteorologist in Illinois. Multiple deaths have been confirmed, including a man killed by a snow plough in Chicago; another found frozen to death in a Milwaukee garage; and a young couple who died after a traffic accident on snowy roads in northern Indiana. How is it affecting daily life? Hundreds of schools have been closed in the affected states. At least 1,300 flights were cancelled early on Wednesday, mainly out of Chicago O’Hare and Chicago Midway international airports, said FlightAware.com. The US Postal Service has also cancelled mail deliveries throughout the Midwest on Wednesday. Even beer deliveries in Wisconsin have been hit by the cold, as brewers delay shipments over fears their beverages will freeze in the trucks. The National Weather Service is warning that frostbite is possible within just 10 minutes of being outside in such extreme temperatures. Chicago mayor Rahm Emanuel has urged people not to venture outdoors if possible. Dozens of “warming centres” for the estimated 80,000 rough sleepers there, including buses. But at least one homeless Chicago man said he preferred to take his chances with the deadly weather, rather than go into a shelter. 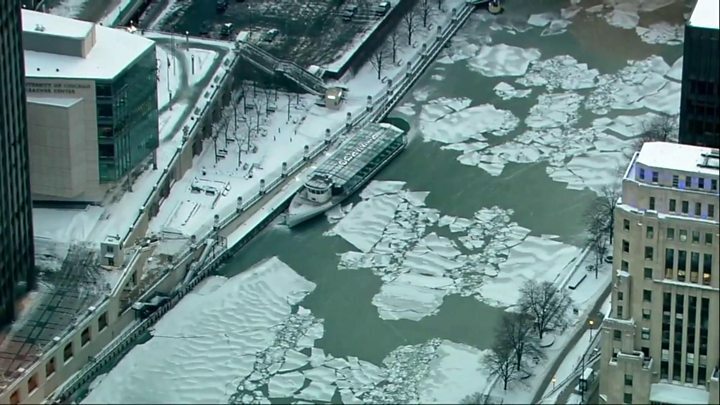 Chicago landmarks including the Lincoln Park Zoo, Field Museum and Art Institute are closed. Those braving the cold on Wednesday will also be hard pressed to find a warming cup of coffee – La Colombe has shut all five of its Chicago cafes, as have other local shops. Delivery pizza – a traditional bad-weather food in the US – has also been affected. Chicago’s famous deep dish pizza chain Lou Malnatis and other regional restaurants closing early on Tuesday and Wednesday. Chicago police say people are being robbed at gunpoint of their coats, especially those wearing Canada Goose jackets, which can cost as much as £900 ($1,100). Animal rights organisation Peta has warned people to bring animals indoors. Frigid weather could cause pregnant cows to deliver ahead of schedule, the farmers said, and newborn calves cannot survive such conditions. Meanwhile, police in McLean, Illinois, some 150 miles (240km) from Chicago, had some fun with the freeze, announcing that Elsa, from Disney movie Frozen, had been arrested over the extreme cold.